The Learned Pig Project was started in September 1999 by Marko from Panama. Marko's idea was essentially to mimic the Project Gutenberg for magicians. Project Gutenberg's purpose is to digitize public domain books. 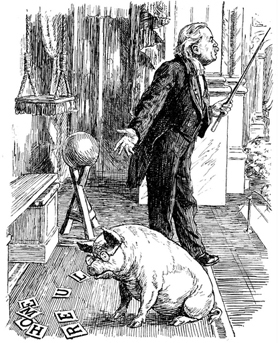 The Learned Pig Project's goal is to digitize public domain magic books. When Marko started he had four books digitized: My Magic Life (Devant), Miracle Mongers (Houdini), The Lives of the Conjurers (Frost) and Behind the Scenes with the Mediums (Abbott). He would later add dozens more. In late 2011 Marko shut down the project due to security issues on his website. To prevent the loss of this great resource we (Lybrary.com) decided to purchase TLPP from Marko and continue to host it on our website. To get access to the magic ebooks, articles, sketches and tricks you will have to register a customer account at Lybrary.com and enable the magic newsletter. Once you do that you will see in the Tools section in your account a link to TLPP. So much magic literature has been lost to the fraternity over the years, that I feel that we all owe our gratitude to Marko who put this project together, as well as to the Lybrary who is keeping it alive. Since 4 years, I went no more on old tlpp site because of malware problems on it, and because it was not more updated regularly. I see the site is new hosted by yourself, I hope it will now be clean! it is a great source of classic magic! Thank you! Hi Chris, I was a big fan of The Learned Pig Project for several years until it went away. amazing material, just wish it was updated.